Several people have asked if they can buy the iPhone X in the US and then use it in another country such as India, China, or Russia. While I did buy an iPhone X I have not tried to activate or use it outside of the US myself. While I cannot 100% tell you if it will work, I’d say it should. Apple sells two iPhone X models. The A1865 and the A1901. In the USA, the A1901 only works with AT&T and T-Mobile. The A1865 works with AT&T, TMobile, Verizon or Sprint. The difference is that the A1901 only supports GSM / LTE cellular technology while the A1865 supports both GSM / LTE and CDMA. The either of these iPhone X models should work in any country. Apple maintains a list of supported carriers for each model and country. 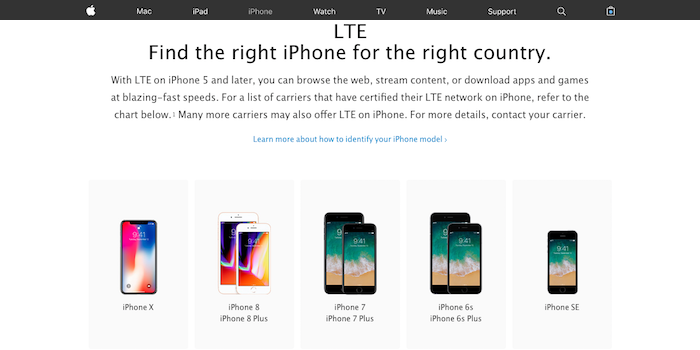 You can see that list here: https://www.apple.com/iphone/LTE/#iphone-X. If you don’t see your carrier on the list, the iPhone may still work with your operator. You may need to manually set the APN in cellular settings so that your cellular data connection, MMS picture messages, and group texts will work. If you are unable to set the APN manually in settings because the option is hidden, then you may need to find and install the appropriate APN carrier profile. If you are buying the phone to use in the USA the A1865 model is best because it is compatible on all four major networks. If you are buying the iPhone X outside of the USA the A1901 should also be a good choice as long as the mobile operators in your country use GSM / LTE but do not use CDMA. Most countries other than the US do not use CDMA. When you order an iPhone X from apple.com, you’ll need to choose the carrier, finish, and capacity. As of Nov 27 2017, there are four options for the carrier, AT&T, Verizon, T-Mobile, or Sprint. Choose AT&T or T-Mobile for the A1901. Choose Verizon or Sprint for the A1865. At some point in the future there may be a fifth option, Buy without a carrier. SIM-free. Activate with any carrier later. The SIM-free option is the A1865. If SIM-free is available choose this option. If the SIM-free model isn’t available, choose one of the other four carriers, depending on which model you want. You’ll need to choose Pay in full, One time payment. If the apple.com, prompts you to choose activate now or activate later choose activate later. Apple adds SIM-free unlocked phone to its iPhoneX lineup.